Look what I made from 31 Fallout 4 Pool Balls only using Outfit Studio when I got bored one night! I decided to share this horrific abomination with everyone!... No, I wont take it back! All assets within are from Fallout 4, so due to Bethesda's ToS you can't convert it to other games. 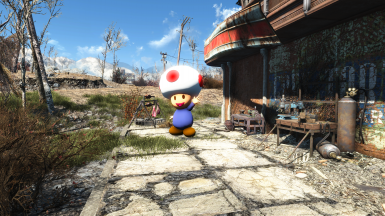 I will put the OBJ File of this available for download as a resource, and please feel free to use this as you would like in Fallout 4. Credit me (and Nintendo for Toad concept) if you use it in a mod yourself. This Statue was made by me with 31 Fallout 4 Poolball assets using Outfit Studio, Material Editor, NifSkope, Paint.Net, FO4Edit, and the CK for the ESL File (along with help from the template listed above). Have you ever said to yourself: "SELF! I'm bored... I need to come up with something to do that wont randomly injure myself like usual." "I know self! I should extract the Pool Ball mesh from the Fallout 4 game and one by one bring them into Outfit Studio and using only those tools morph and conform those Pool Balls into some horrific abomination that I can turn into a Statue for everyone at Nexus Mods to "enjoy"
What...? It's not weird! I mean glorious masterpieces like this would never have been brought into existence if it wasn't for insanity boredom. I feel that this really adds to my immersion around any and all of my Settlements in Fallout 4... mostly due to the custom Vault 111 Suit that he is wearing. It is like Toad was frozen (of the cryogenic variety) alongside you and your waifu or husbando. You know that you want it... that you will not be able to continue playing Fallout 4 without it... I bring to you my meticulously crafted horrifying abomination beautiful masterpiece "Pool Ball Toad Statue"!! 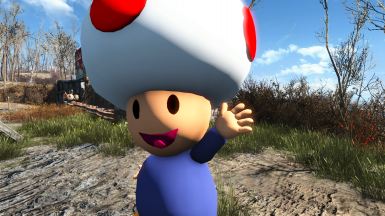 This Toad was made entirely by me using Fallout 4 assets, Pool Balls to be specific, 31 of them to be even more specific. I did use a template of a Trophy from a Super Smash Brothers game to look at while making it... but I assure you nothing from Nintendo (asset wise) is in this mod. 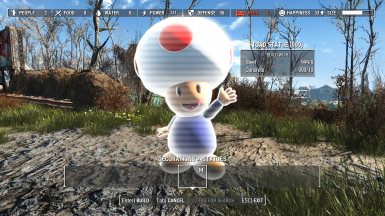 You can craft these glorious Toad Statues at any Work Station in the game under the Decorations -> Statues Tab, Toad will be the one that is blank as the Art Work didn't wanna show up from the Transform. They will cost 8 Concrete and 10 Steel each to craft and you should be able to craft them indoors also (I haven't tested this though). I had a hard time getting this in game for whatever reason... it kept CTDing due to Mesh issues, but I finally got it fixed! 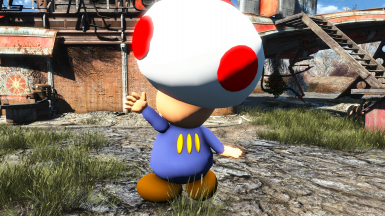 I feel like I should give credit to Nintendo for the concept of Toad even if no Nintendo assets where used in this mod. None aside from some minor clipping that you can occasionally see around the mouth that I am too lazy to fix. Report any bigger ones if you come across them please. I recommend using NMM to install this, then just activate the ESP or ESL. If you do not use NMM then just copy the mods Data folder into the Data Folder of your game and activate the ESP or ESL file. This Statue was made by me with 31 Fallout 4 Pool Ball assets using Outfit Studio, Material Editor, NifSkope, Paint.Net, FO4Edit, and the CK for the ESL File (along with help from the template listed above). 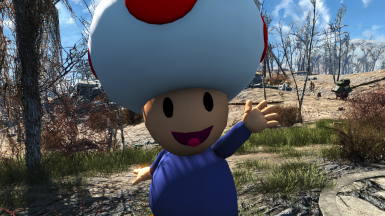 This Outfit Contains 100000000% Toad by volume!